Green products have been around since the 1970s, but it&apos;s only in recent years that they&apos;ve become ubiquitous. That&apos;s because savvy green marketers are no longer targeting "deep green" consumers with a "save the planet" pitch. Instead, they&apos;re promoting the added value their products provide: better health, superior performance, good taste, or cost-effectiveness. In this innovative book Ottman argues that emphasizing primary benefits -- the New Rules -- is critical to winning over the mainstream consumer. 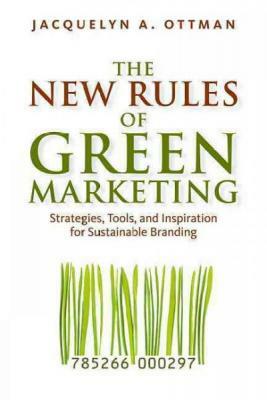 The New Rules of Green Marketing captures the best of Ottman&apos;s two previous groundbreaking books on green marketing and places it within a 21st Century context. Focusing on a new generation of marketers who likely grew up with an appreciation for sustainability, it provides in one place essential strategies, tools, and inspiration for connecting effectively with mainstream consumers. Jacquelyn A. Ottman, founder and principal of J. Ottman Consulting, has been working with green businesses since 1989. Ottman counts among her clients over sixty of the Fortune 500, several U.S. Government labels programs including the EPA’s Energy Star and the USDA’s BioPreferred labels. She is the author of the bestselling Green Marketing.